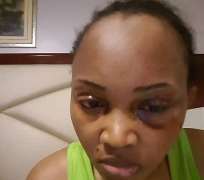 Nollywood actress, Mercy Aigbe, has shared a chat with her hubby after he came on a private chat begging her to remove all the pictures of domestic violence she has been posting on her page. Mercy might still be in love with her hubby but she is not happy with the way things turned out especially when beating is involved. During the private chat, Mercy made her hubby to promise that he will never raise a finger on her anymore which he promised never to.